Have you thrown your face lately? Have you ever met someone—a nice enough someone—and somehow just couldn’t feel comfortable around him/her? There’s no expression in English that can explain this phenomena, but the Japanese have the perfect saying: mushi ga sukanai. The nearest thing I can come to a translation is ‘the inner being does not like’—and that’s pretty weak because who can really translate an idiom? Idioms are peculiar, flexible, figurative word groupings that make perfect sense to people in a certain part of the world but which leave others shaking their heads. They can be metaphorical, have a historical/cultural basis, offer some kind of analogy or make no sense at all. They can be a tourist’s nightmare and are always a challenge for writers whose books are set in another country. Occasionally idioms from different countries will share the same word. Face, for instance. You have ‘saving face’ in both the western and eastern countries while in Spain someone who is trying to make a good impression is said ‘to throw face.’ Sometimes there is an even more definite correlation between idioms, for our ‘don’t make a mountain out of a molehill’ becomes, “making a bull out of a fly” in Finland and ‘making an elephant out of a goat’ in Estonia. Idioms can be a pain because you can’t explain them. I remember talking to our tour guide in China and calling myself a ‘turkey’ because I had done something foolish. She looked at me blankly and, when I tried to explain, wondered if a turkey was really foolish. “Why not a fish?” she wanted to know. “Or a beetle?” Why not, indeed. Some idioms can be downright hilarious. In defining a cheapskate (another odd, idiomatic word) Syrians speak of an ‘ant milker.’ A forgetful person in Portugal is said to have a head of rotten garlic. “Quit ironing my head!” yells an Armenian when someone is bothering her. And the French say that wasting effort is like ‘combing the giraffe.’ Cool imagery! Actually, there are some idioms that make sense. Instead of beating around the bush, Czechs say that someone is walking around hot porridge … and anyone who has waited for hot grits to cool can see that this is smarter than running about smacking bushes (yes, yes, I know they used to beat bushes for game birds and such… but grits taste better). Also, though ‘spending money like water’ evokes a good picture, I think that the Chinese ‘spending money like soil’—especially in a country where land is so important— has more punch to it. I have used that expression so often… isn’t it an odd feeling? I love to read idioms from other countries, Donna. They make the country come vividly alive, somehow!! Oh, Sue, you are so kind! I enjoy the idioms from other lands because they make people very real, somehow. And, translated, they sometimes make sense!! Now, I think I’m beginning to understand why publishers discourage the use of idioms. They might “go over your (reader’s) head.” Thanks for sharing examples of idioms from various places. 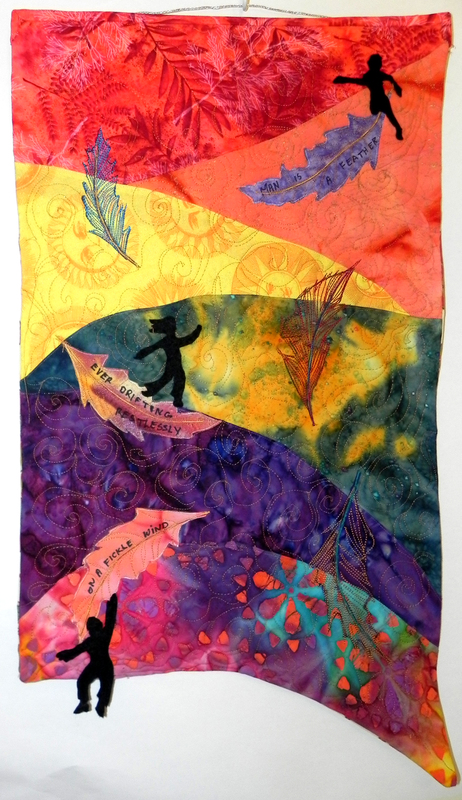 Your poem on the art quilt is a message all its own. I love your posts. Isn’t it? We are all so dofferent… And so similar! i loved the idea of your putting haiku with fabric art. this is one piece, but i bet you could do several others. thanks for this excellent essay. as usual, they all seem to combine your talents of art and writing ideas. how about “too hot to handle” .. is that an idiom? Yup, it surely is! A lot of our sayings are idioms… and if I stop to think, I use them all the time! !